The nice thing about poaching chicken on the weekend is that you can then make really quick weeknight meals. 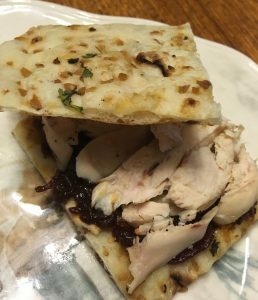 Throw a little garlic naan in the toaster oven (I just used some frozen pre-made naan), and then you can top it with all kinds of things. 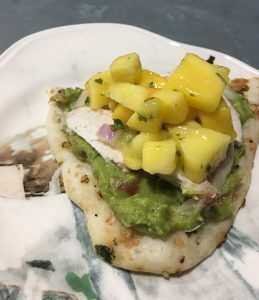 In this case, I did one open-face sandwich with store-bought guacamole and mango salsa (yum), and one toasted sandwich with homemade seeni sambol (also yum). Add in a little salad or some roasted veggies, and you have yourself a very nice meal.